Then about a decade ago I suddenly find that the floor cleaner I have been using causes the grout between my floor tiles to come off. Later I find that the synthetic scents of my laundry detergent is not so "nice smelling" any more, must be the effect of being pregnant. That's when I started to look around for alternatives, one that has no fragrance, does not cause damage to my home and still meets the other 2 criteria. I was feeling quite vexed because I took a whiff of every laundry detergent on the supermarket shelf and find them either too over powering or smell funny; yupe pregnancy hormones at work. My search leads me to look towards eco-friendly cleaning products as they are usually fragrance free, they did claims to clean better without causing any damage to the house BUT they do burn a big hole in the pocket in long run. I managed to find a "Clean, Green Company" eco-friendly brand that focus on "environmental wellness" and is serious in "getting harmful and toxic chemicals out of your home". Their price is not cheap too but because their cleaning products are concentrated, such as one bottle of 480ml toilet cleaner may last me 2 to 3 months, which works out fine for me. I took a step further earlier this year and decided to "go green" on my laundry, I decided to exchange my laundry detergent with a naturally occurred item - baking soda. This seemingly unimportant item actually is a versatile ingredients that can be used around the house. Baking soda is a natural deodorizer and cleanser, it makes white clothes whiter and colored clothes brighter. Well, I could go on and on about baking soda but that's for you to read it up since the info is easily available online. Anyway, in my journey to be more eco-friendly, I am also in search of things that can enhance protection for my family against the daily bacteria, germs and virus YUCKS! Today I am introducing 2 products from Young Living, the world leader in essential oils and wellness solutions. These products are safe to use around children and pets, they are concentrated, all-natural formula Thieves household products which is a must-have products in all homes. Thieves is an essential oil blend that includes Clove, Lemon, Cinnamon Bark, Eucalyptus Radiata and Rosemary. It is a highly versatile blend of oils that can be used for cleaning and for healthy immune support. The Young Living Thieves Household Cleaner can be used to remove stains on various surfaces with its safe general-purpose concentrate without the use of harsh chemicals. It is a non toxic house cleaner made with natural surfactants and Thieves leaving a refreshing welcoming scent in every room. The natural ingredients include Deionized Water, Alkyl Polyglucoside, Sodium Methyl 2-Sulfolaurate derived from coconut, Disodium 2- Sulfolaurate and Soy Lecithin (a natural emulsifier). 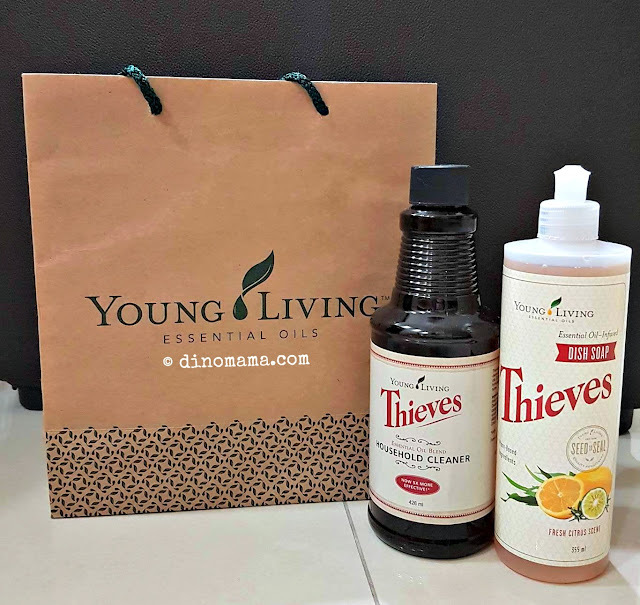 As with the Thieves Household Cleaner, the Young Living Thieves Dish Soap (is also non toxic and made with natural derived ingredients, it is free from SLS (sodium lauryl sulfate), petrochemicals, dyes, formaldehyde, phosphates, synthetic fragrances and perfumes that may dry and irritate skin. The natural botanicals in it leaves your dishes sparkling clean with a fresh scent! However, this dish soup cannot be used in automatic dishwasher and remember to keep it away from direct sunlight. * Dilute with water in spray bottle or bucket, or use directly for extra effect. Notice: Before cleaning upholstery, fabric or carpet, perform a spot test in an inconspicuous location. Discontinue use in the unlikely event of staining or skin irritation. 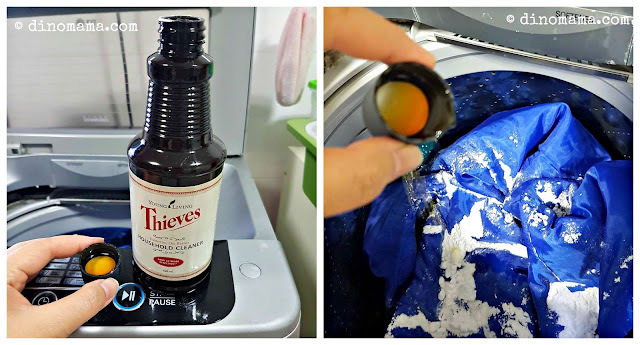 Since thieves is such a versatile oil and with disinfection properties I used the Young Living Thieves Household Cleaner in my laundry washing, a half cap is enough for half load of washing. I love the spicy smell that lingers even after my clothes are washed. I use a lot of utensils, cutlery and pots when I'm cooking, plus I like to wash as I cook so you can imagine the number of times I have to use the dish soap for washing. With Young Living Thieves Dish Soap a little bit of it is good for all the washing I have for one meal preparation. Concentrated household cleaning products may be more expensive than the store bought ones but a little goes a long way, don't you agree with me? Also, since Thieves Household Cleaner can replace a few other cleaning products my budget for household cleaning products will be reduced significantly. How not to like about that?! These eco-friendly products are definitely going to be in my house from now on. Thieves Household Cleaner – providing a deep clean for oil remover, mirror and glass stains, and carpet spots. Thieves Spray – easy-to-use spray for regular clean on knobs, handles and frequently touched surfaces. Thieves Wipes – a quick way to clean tables, toilets, kitchen surfaces. Thieves Automatic Dishwasher Soap and Thieves Dish Soap – gentle to hands yet effective on the dirtiest dishes, leaving dishes sparkling clean. You can get your Young Living Thieves Cleaning products over here. Disclaimer : We received a bottle each of Thieves Household Cleaner and Thieves Dish Soup for the purpose of this post. No other compensation were received. All opinions in this post are 100% ours and based on our experience with the products. I have some products in home which are very soft and its cleaning very hard. SO i will try out your product for next time.